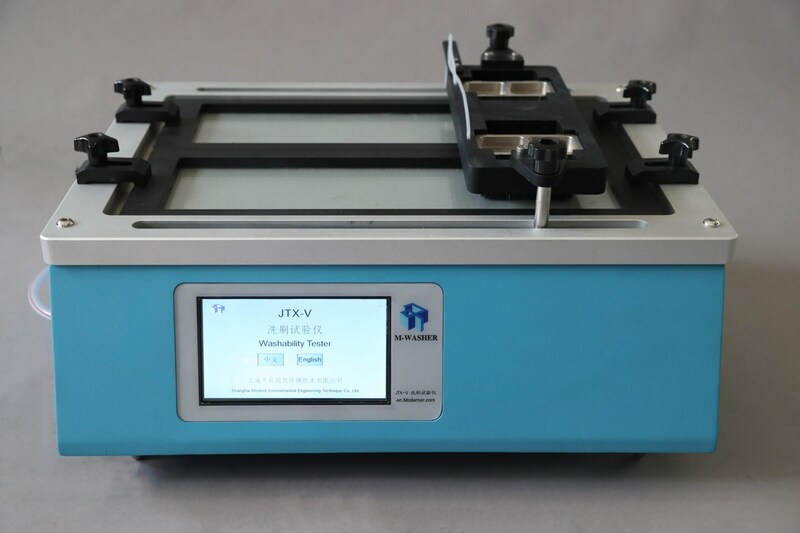 JTX-V Digital multifunction Washability Tester(Scrub resistance, Stain resistance and Wet-scrub resistance) produced by our company is in accordance with GB9266-88 «Determination of scrub resistance of film of architectural paints and coatings», GB/T 9755 «Synthetic resin emulsion coatings for exterior wall»-Standard appendix C requirements for washability test, GB/T 9780《Test mothod for dirt pickup resistance and stain removal of film of architectural paints and coatings》-Standard for stain resistance test, and GB/T31410 «Paints and varnishes: Determination of wet-scrub resistance and cleanability》 It is applicable to perform an Scrub resistance, Stain resistance and Wet-scrub resistance test on coated panels to define the resistance of paints, varnish or related products to scratching and wear, sometimes also suitable for testing surface treated by the comprehensive films, such as paints, electroplating coatings, floors, overcoat and woodpanels. The machine drives the brush to move back and forth and scrub the coatings on coated panel. The scrub counts can be directly read out from the counter of the machine. 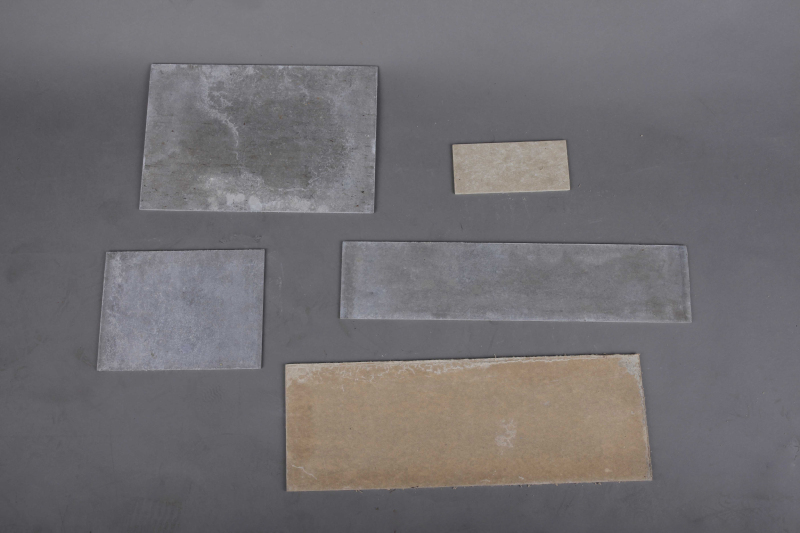 It can examine the scrub resistance of the coatings according to scrub counts and to evaluate stain resistance and wet-scrub resistance properties of the coating according to the contrast of before and after washing. 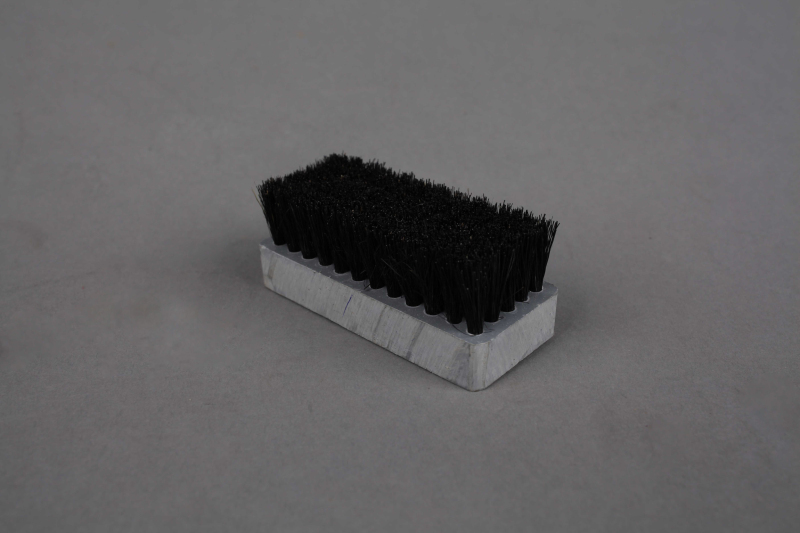 Brush (with holder) weights 450g, frequency of reciprocating travel is 37 （20/25/30/35 optional）times/min, its standard Stroke Length is 300 /one way（200/250 optional）mm. 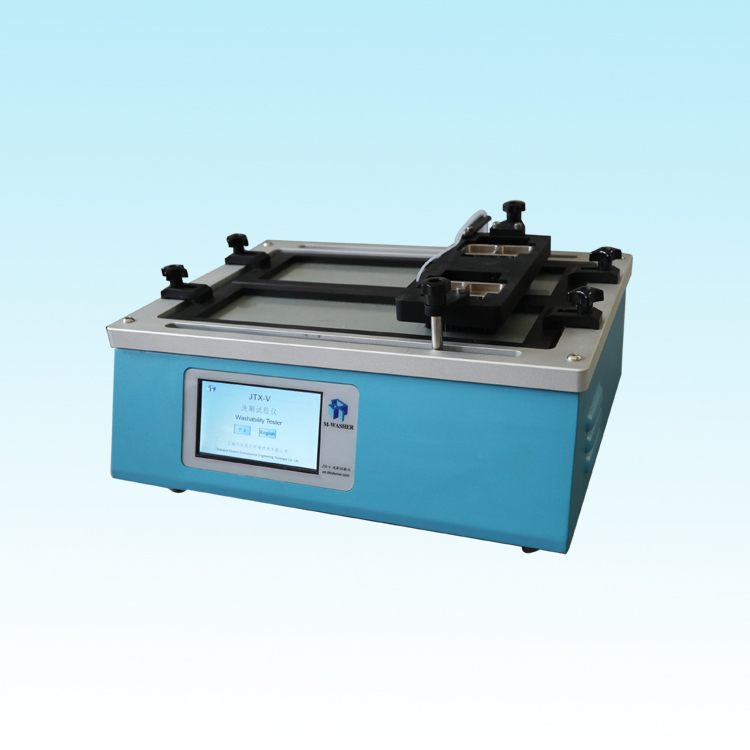 Grinding Head（with Grinding Head Holder and weight）for Stain resistance test weights 1500g，frequency of reciprocating travel is 37（20/25/30） times/min, its standard Stroke Length is 300 /one way （200/250）mm. 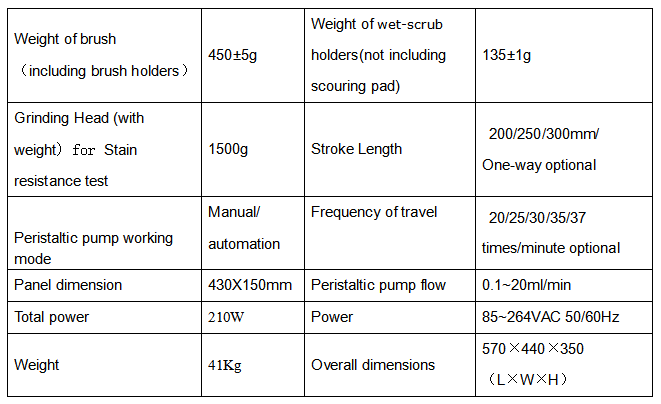 When do Scrub resistance test, it should be adjusted water velocity according to National Standard request. 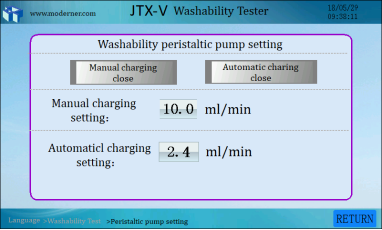 The water velocity is controlled by the two - channel peristaltic pump, which ensures the water output of both channels is consistent. 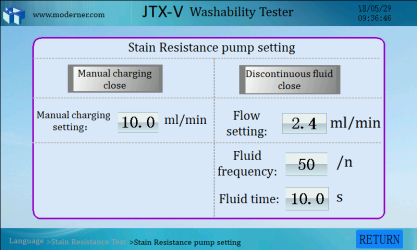 It is not necessary to add liquid manually during stain resistance test. Just set frequency and time of adding liquid. 1、Put brush to soak in the 20℃ water for 30 minutes, the soaking depth is 12mm, then taking out brush, powerfully press water through, soaking in the 0.5% soap water for 10 minutes again. 2、Put test panel on the working plate, fastly grip test panel by both-side chuck. The test panel can’t have moving phenomenon during working. 3、Put the brush in the brush base, tighten fixed bolt to fasten brush, then connect brush to cross beam to make sure brush moving freely. 4、Put the inlet pipe of the peristaltic pump into the scrub media container. 5、Turn on power, select the language. 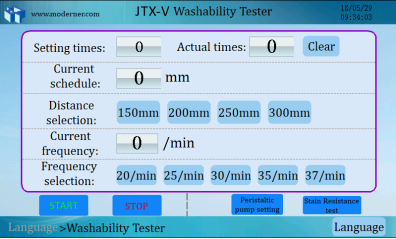 6、The default interface is Scrub resistance interface, set the test times, select stroke Length and test frequency. 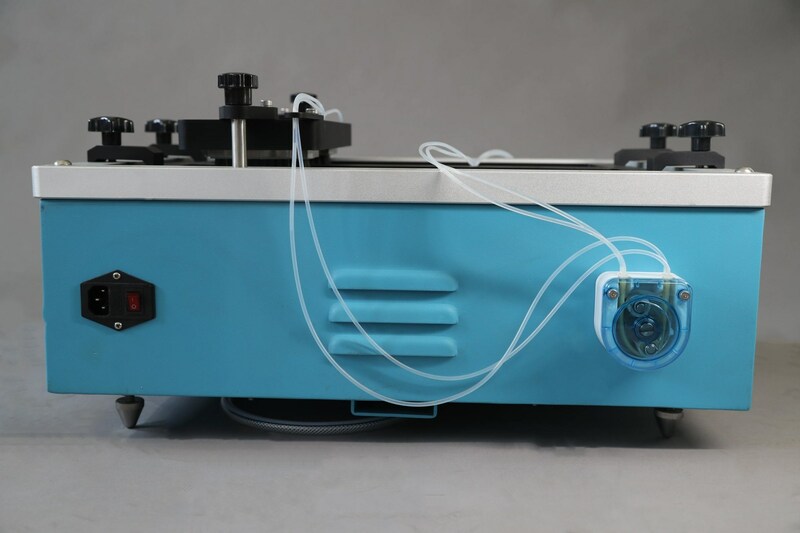 7、The peristaltic pump will automatically drip scrub media when turning on the automatic adding liquid switch during scrubbing. If you want to wet first, you can click manual mode. After the test panel is wet, close manual mode. 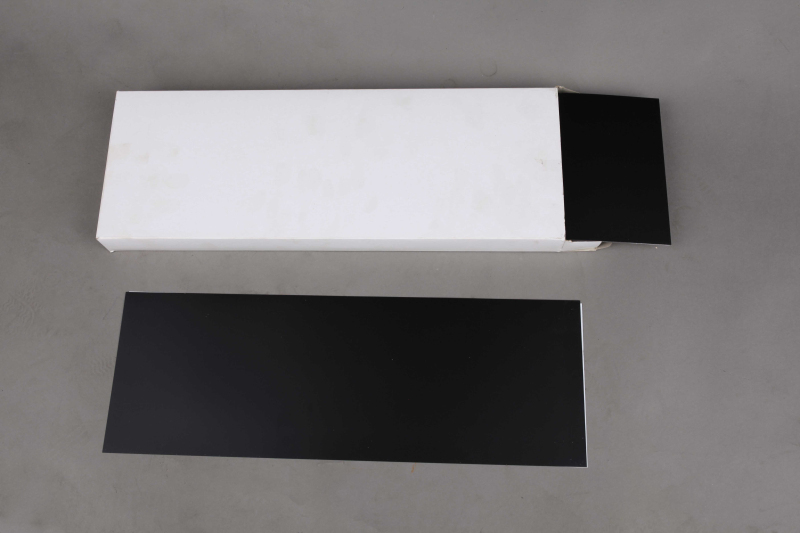 8、Observe the 10cm place on the middle of test panel whether it is wear and tear. If you want to stop machine during testing (not reaching set times), you have to push “stop” button, stop scrubbing. If you want to scrub continuously, you just push Start button. 9、When the test panel isn’t wear and tear, the machine will automatically be stopped when reaching set times. If you want to test continually, you have to push “reset” button, the counter displays “0”, otherwise you can’t start machine, then push “start” button again, counter resume to count number and sums scrub times. 10、If the machine is used for inspection, you only need to set acceptance times, starting machine, machine will be stopped automatically after reaching pre-set times, checking test panel if it is wear and tear, so as to determine the quality of coating. 1、Put test panel on the working plate, fastly grip test panel by both-side chuck. The test panel can’t have moving phenomenon during working. 2、Fix the non-woven fabric on the grinding head holder, then connect it to cross beam, put on proper balancing weight. 3、The following like the previous “Scrub resistance Test” steps. 4、It is not necessary to add liquid manually during stain resistance test. Turn on the intermittent adding liquid switch to set frequency and time. 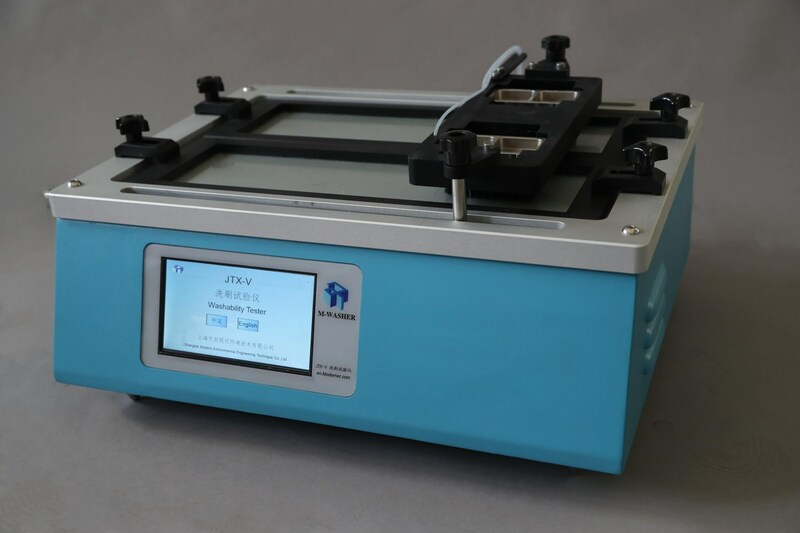 1、After finishing every test, you have to clean up storage container, glass board, brush and working components, using dry-cloth to wipe out the front panel and frame to prevent rust. 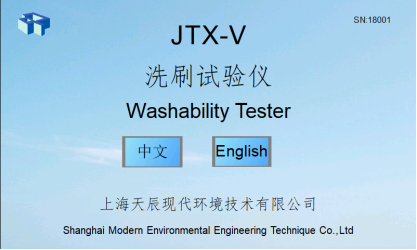 2、Manufacturing test panel should be in accordance with national standard request.